AP Initiative Chairman Funabashi’s “The North Korea Problem” appeared in the June edition of Ushio. 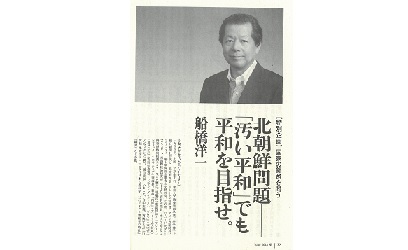 Chairman Yoichi Funabashi’s essay “The North Korea Problem: Let’s Aim for Peace even if it is ‘Dirty Peace’” was the lead article for the June special edition of the monthly magazine Ushio. In this essay, Chairman Yoichi Funabashi claimed that ① North Korean leader Kim Jong-un made the decision on the North Korea-United States summit due to pressure from economic sanctions and fear of U.S. President Donald Trump, ② it is indispensable to make President Trump realize before the summit meeting that North Korean denuclearization is a vital interest of the U.S.-Japan alliance, ③ although it is possible the six party talks will not function effectively because of some geopolitical factors, this process should still be pursued.